Nu-Heat is committed to designing bespoke energy efficient heating systems that perform in every project, but what really sets us apart from our competitors is the way we work with you – starting from the very first time you get in touch, to years after the system has been installed. When you first get in touch with Nu-Heat, our aim is to help you choose the right solution for your project. Our Business Development Team take all of our new enquiries and will talk through the details of your project and what you are looking to achieve, whether you are hoping to install underfloor heating in a new build or a renovation, or if you are looking to install a fully integrated renewable solution. Once we have an understanding of your project and whether our products will be suitable, we will ask for a set of your project plans. Plans help our Estimating team to pick the most suitable solution and give an accurate quote price. Read more about why your plans are so important. If we don’t think underfloor heating or renewables is right for your project, we will always let you know. As soon as we log your plans, you are allocated an Account Manager who will handle your project from start to finish. They will be your first port of call if you ever have any questions and you can expect them to get in touch if we need more information or clarification on your project. Your Account Manager sends your plans to our Estimating Team who begin by checking that everything is to scale and measure the areas requiring UFH. They also estimate the heat loss of the building using insulation details, looking at building shape and amount of glazing, checking for any areas with voids or high ceilings. The quote, with an estimate cost for the most suitable system for your project, is then sent back to your Account Manager who will double-check everything again before sending it on to you. Some projects are more complicated than others and may require specialist evaluation, especially where renewables are involved. If your project needs this, we will arrange for one of our Field Sales Team to visit your site to talk through the options. When you are confident and happy with the solution we have recommended and any revisions have been made, your Account Manager will send you a finalised quote. This will reflect the final price based on the most economical and efficient solution for the project based on how the property will be used. An important stage in your project journey, this is where our team of designers double-check all of the information you have provided. 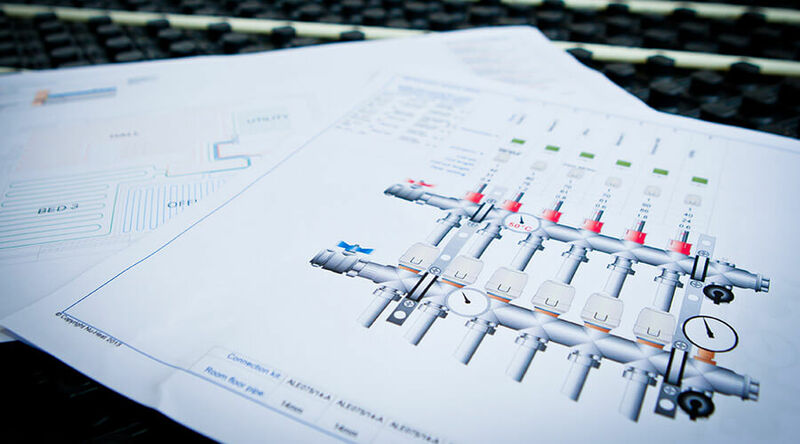 We will then produce accurate heat loss calculations and CAD drawings with detailed tube layouts to provide you with a system that is simple to install and designed to perform. We always get drawings back to you within 10 days. When you have checked over the drawings and everything is ready to go, we will contact you to arrange delivery. We can arrange a full or part delivery on the date you require. You will also receive a comprehensive handover pack, manuals and system user guides. We like to think that your system will be installed quickly and simply, without any problems. If you do need some support, whether you are the installer or system owner, our Technical Team are available on the phone to help with any queries and we also have a FAQ for troubleshooting on our website. Our Field Service Engineers are also able to help with any on-site support, something that can prove useful if you are installing a complex renewable solution and need help with commissioning. Find out more about how we work with you on our website.